Riviera Dunes offers a preferred solitude...a rare tranquility. 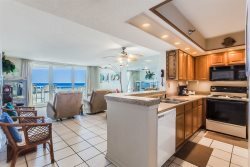 One of few low-rise beachfront condominiums on Perdido Key with 5 stores and only 15 units, Riviera Dunes is a rare find. In addition to your beautiful beachfront condo, you'll have access to a swimming pool, hot tub and boat docks on Old River. The units are bright and spacious with a large balcony from Living Room and Master Bedroom. Three bedrooms, three bath and four bedrooms, three bath units are available.